Asia is considered by many in the gaming world as the crown jewel in terms of revenue, if not so much in infrastructure terms. 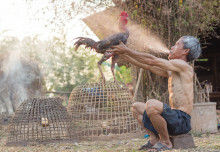 But as Sanum Investments is finding out, it can be a very tricky place to operate; the company’s minority partner has turned on them, and appears to be using government contacts to have Sanum removed from Laos altogether, leaving their substantial investment behind – allegedly. Jody Jordahl talked to Casino International about what has been an incredibly difficult 18 months. Casino International: Jody, what’s going on in Laos with Sanum? Jody Jordahl: We’re very frustrated. About five years ago we were approached by the Laos government, and our minority partner, and were asked to bring expertise and capital into the country. After meetings with high-ranking government officials, including the former Prime Minister, we were given assurances that the rule of law would be enforced and that we would be fairly treated, so we decided to invest. Over the last five years we have invested over $85million US, we employ over 2000 Laos citizens, we have trained more than 10,000 citizens, we have generated millions of dollars in ancillary revenue, and an additional $6m in tax revenue… we’ve been good for the country. About a year and a half ago, our Laos minority partner, with the help of the government, started working to systematically strip us of our various projects. As of today, speaking with you, we have one project still in operation. 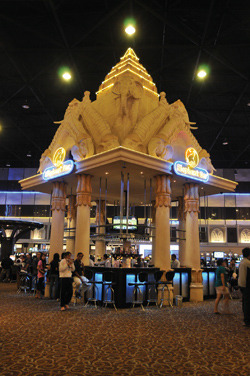 Our most profitable project, the Thanaleng Slot Club in Vientiane, the capital, has been taken from us. The courts were used as the mechanism for that, and we were given less than 48 hours notice, and given less than two hours to present our evidence, call witnesses; the judging panel deliberated for less than 30 minutes, then returned with a pre-written, eight-page, typed decision which stripped us of our ownership of the project and also fined us $5million! CI: What was the fine for? JJ: Basically, it was for having the gall to fight this in court. It was a punitive damages fine. At the end of proceedings we were given notice that all of our financial accounts had been seized by the government. The notice of seizure was actually signed two days before the trial took place, so I think it’s clear that it was not a fair and free trial. CI: What justification was given? JJ: When we first invested in the country it was under a master agreement, with our minority partner. We paid millions of dollars for 60 per cent of all of their gaming projects in the country. That relationship is completely governed by that master agreement. With the Thanaleng Slot Club, there were already machine supplier contracts in place, so we did a very short-term participation agreement, which was set to expire in October 2011. Once that machine supplier contract expired, we could come in and take over the management. We couldn’t take it over earlier, because they were contractually obligated to machine suppliers. As we got closer to the day we were contractually able to take on that management of the slot club, and get 60 per cent of the revenue, our minority partners became less willing to work with us, less communicative, and the relationship began to deteriorate. Their argument was that because the participation agreement expired, they no longer had any contractual obligation to do business with us, which is clearly erroneous if you take even a brief look at the contractual agreement. Nevertheless, the government sided with them, as we had been advised they would, and stripped us of our investment. In that project alone we invested over $25million, while our minority partners invested no capital. After five years of growing that project, it had grown from making $100,000 a month to making $3m a month, as a result of our capital and expertise. CI: What happens next – do you go back to court? JJ: Prior to filing the BIT petition, we followed every possible avenue inside the country. We worked with the government to try to mediate a solution, with our minority partners, with the courts, the ministry of planning and investment, the national assembly – all to no avail. Unfortunately our partners are very well connected and there are high-ranking government officials who have made the decision to strip us of this. We’re hopeful and expect that the government will honour its obligation, under contract, at this point they still haven’t. We still have that one project operational but it’s under the threat of imminent closure. The government recently served us with $22million of retroactive tax notices, and they are moving forward to shut down and liquidate the property. JJ: This is a country that is striving to join the World Trade Organisation, it’s working to integrate into the global economy. It’s really unfortunate. They need hundreds of millions of dollars of foreign investment and a case like this can have very serious negative long-term repercussions. If the investment community and the gaming community see that this is not a good place and the government cannot be trusted, they’ll take their money elsewhere. CI: Is the situation salvageable? JJ: There’s no reason why Laos can’t be a fantastic place to invest, there is so much going for it and there has been tremendous growth over the last 10 years. When we first started there we had great relationships with the government and our partners, and the people of Laos have been terrific. We don’t think this has come to the point where it is irrevocably harmed, we hope we can move forward, and the government takes responsibility and fixes the issues it has caused; we’d like the rule of law to be fairly enforced, and to get a return on our investment. CI: Where in government has this come from? One source? JJ: Our partners are well connected with numerous government officials, as we have come to find out over the last 18 months. It’s something I think they had been working on for a while. One relationship I can talk about is our minority partner’s daughter is married tot eh Vice President’s son, and the VP was the former president of the national assembly and is incredibly well connected. There is no doubt in my mind that some of his political clout is being used to run us out of town.